"Perhaps one of the most popular national heroes of the late 19th century in Victorian Britain, Livingstone had a mythic status, which operated on a number of interconnected levels: Protestant missionary martyr, working-class ""rags to riches"" inspirational story, scientific investigator and explorer, imperial reformer, anti-slavery crusader, and advocate of commercial empire. His fame as an explorer helped drive forward the obsession with discovering the sources of the River Nile that formed the culmination of the classic period of European geographical discovery and colonial penetration of the African continent." African explorer (1813-1873). Autograph letter signed. Burnbank Road, Hamilton. 8vo. 3 pp. on double leaf. Together with an album with letters to Foster by Henry Cole and others. 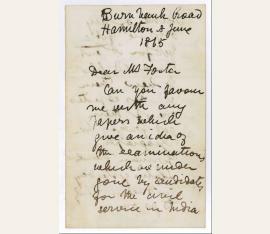 The letter is addressed to Peter Le Neve Foster, Secretary to the Society of Arts, with whom Livingstone corresponded a good deal during this period, asking him to supply samples which give an idea of the papers for the Indian civil service examinations: "[...] Neither of my boys are fit as yet for it but I would like to shew them what is expected one of them got prizes for Geography German French & Latin yesterday and seems likely to go on in these studies - Another got a prize for drawing - I wish to set them to aim high [...]". - Livingstone worries about the future of his surviving sond, while preparing for his final departure for Africa that August. He had been invited to return to Africa by the Royal Geographic Society that January, in order finally to sort out the problem of the Nile. He wrote this letter when staying with his long ailing and bedridden mother. 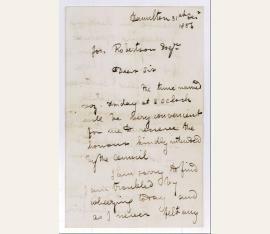 Soon afterwards, thinking that she was rallying, he dashed down to Oxford in order to deliver a lecture, where he received a telegram announcing her death on the eighteenth. He and his wife Mary, who had died in Africa in 1862, had three sons, Robert Moffat Livingstone (1846-64), Thomas Steele Livingstone (1849-76) and William Oswell Livingstone (1851-92). Robert, the eldest, had died of his wounds the previous December, while fighting on the Union side in the American Civil War under the name Rupert Vincent so as not to bring discredit to his father, who was wont to accuse him of trading off his name. In Tim Jeal's opinion, 'Robert's life is really the story of Livingstone's failure as a parent' (Livingstone, Pimlico edition, p. 281). Oswell, the youngest, fell out of favour when in 1872, as a member of the RGS relief expedition that had been upstaged by Stanley, he failed to join his father but instead recommended him to return home, causing his father to dub him 'as poor a specimen of a son as Africa ever produced'. Tom, the middle and eldest surviving son, stayed the course and was to act as his father's chief executor; although it was to be his sister Agnes, Livingstone's doted-upon daughter, who became chief guardian of his reputation. - An album with letters to Foster by Henry Cole and others is included in the lot..
Afrikaforscher (1813-1873). 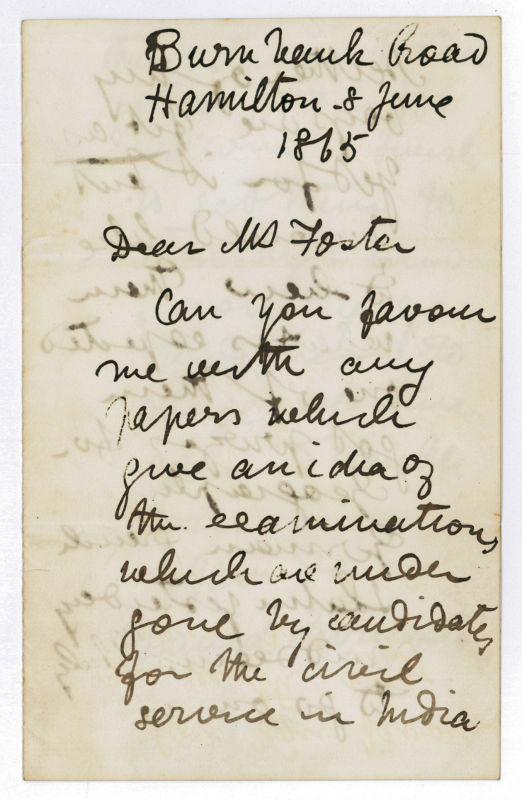 Autograph letter signed ("David Livingstone"). Hamilton. 2 SS. auf Doppelblatt. 8vo. Mit einigen Beilagen (s. u.). 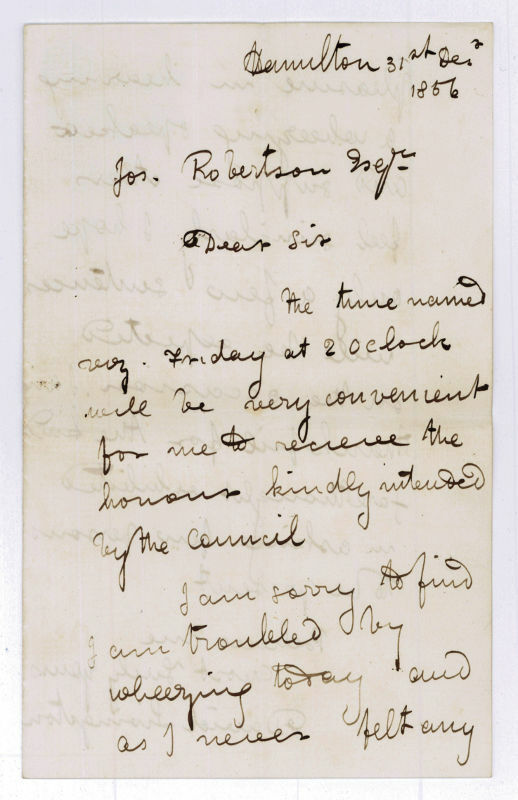 To Joseph Robertson, Chairman of Hamilton Council, agreeing to attend the forthcoming ceremony to mark his receiving the Freedom of the Borough: "I am sorry to find I am troubled by wheezing today and as I never felt any pleasure in hearing a wheezing speaker and suppose others feel similarly I hope only a few sentences will be expected on the occasion. I am grateful for the kind forethought exhibited in asking few persons to be present [...]". - Light dust-staining overleaf, fol. 2 with Robertson's contemporary endorsement ("Dr Livingstone/ African Traveller"). 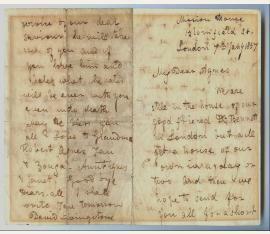 Together with a printed 8vo admission ticket to the ceremony, and a letter from Robertson to his daughter Ella (2 pp.). - Having only recently returned from Africa, Livingstone was spending Christmas with his mother and family in Hamilton, his father having died that February; Hamilton of course being near Blantyre, his birthplace. The present owner is the great-great-grandson of Joseph Robertson, responsible for conferring the freedom of the borough on him. 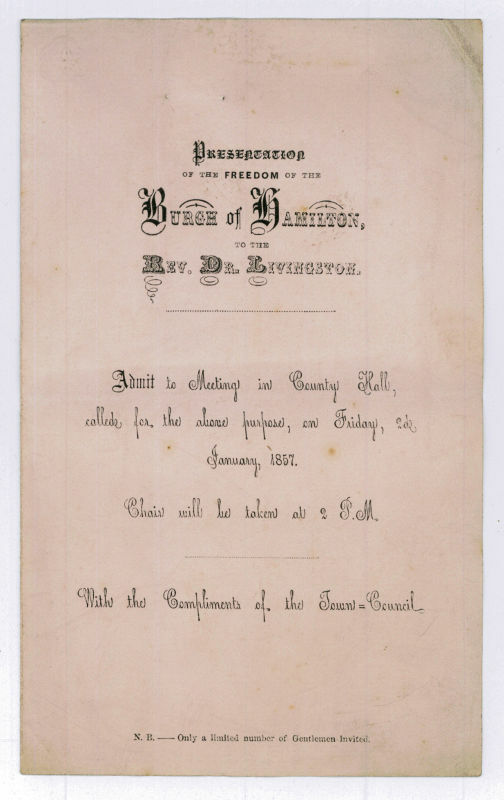 Given that very few people were invited to the ceremony, it is likely that correspondingly few copies of the invitation, an example of which is included here, were printed. Also accompanying the letter is a later note by Robertson to his daughter, recalling that "At a subsequent Soiree or Conversazione at which I also presided [...] I first suggested that a large district, shewn on the sketch map of his explorations, which he produced, should be called Livingstonia, instead of the more modest name he had adopted [...] The suggestion was received by the very large audience, with Great Cheering"..
David Livingstone (1813–1873), Missionar und Afrikaforscher. E. Brief mit U. London, 7. Januar 1857. 4 SS. auf Doppelblatt. Gr.-8°. – An seine neunjährige Tochter Agnes: „We are still in the house of our good friend Dr. Bennett in London but will get a house of our own in a day or two. And then we hope to send for you all for a short time for it is only a short time we can remain in England. We do not wish you to refrain from learning but wish you to go to some good school and schoolmaster each day and during each day and come home every evening to be with Mama + me. We want to see you all every day as long as we remain in England so that you may not forget to love us. You will not got to the school from which Robert came as he did not like it but some one you will all like. And then we go away to Africa in the service of our dear saviour he will take care of you and if you love him and hate what he hate [he] will be ever with you even unto death [...]“. 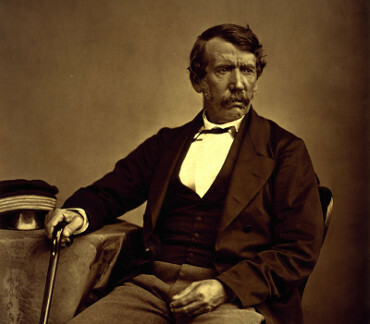 – David Livingstone war im Monat zuvor nach Europa zurückgekehrt und sollte im März des darauffolgenden Jahres für weitere sechs Jahre nach Afrika reisen. Anschließend für etwas mehr als ein Jahr wieder in Großbritannien, brach er im Herbst 1865 erneut auf und sollte von dieser letzten Reise nicht mehr zurückkehren. – Von großer Seltenheit; nur zwei Nachweise von Briefen an seine Tochter auf internationalen Auktionen der vergangenen zwei Jahrzehnte. – Stärker angestaubt und gebräunt und mit kleinen Randläsuren; etwas fleckig und rundum lichtrandig durch alte Rahmung.